MS: “Voodoo” is a mispronunciation of the name of a West African religion that Americans encountered in Haiti. “Voodoo” became a pejorative misnomer for what I experience as a sophisticated system of spirituality. This book is about Ifa, the indigenous religion of the Yoruba people of what is now Nigeria. It is not black magic. In fact, it is not magic at all. Ifa practitioners are clear that what they do is a focused spiritual practice that creates healing by balancing light and dark energies. In the book, I do encounter darkness when someone puts a curse on me, and Ifa practice brings me back into balance. In my experience, this practice is primarily joyful and life-affirming. MS: No. In this mythology, Oludumare is the energy of creation, perhaps equivalent to the western idea of God. Oludumare is the intelligence above all. It’s not a being. It’s simply energy. The orishas are merely intermediaries between Oludumare and humans. Q: One of the myths about “Voodoo” is that its followers worship the devil. What did you find out about that? MS: Ifa does not have the concept of the devil…or of evil. When things go wrong, they are considered out of balance and need to be brought back into harmony through ceremony. One of the orishas, called Eshu, has goat horns and hooves. He is the trickster who lives behind our head and pushes us into self-sabotaging behavior. He is similar to the Shadow in Jungian psychology. When Christians see his image, they project their concept of the devil onto him, but in Ifa practice, once he is honored, he becomes our helper and the messenger to all the other orishas. MS: I was open to exploring polygamy because monogamy had not worked particularly well for me. 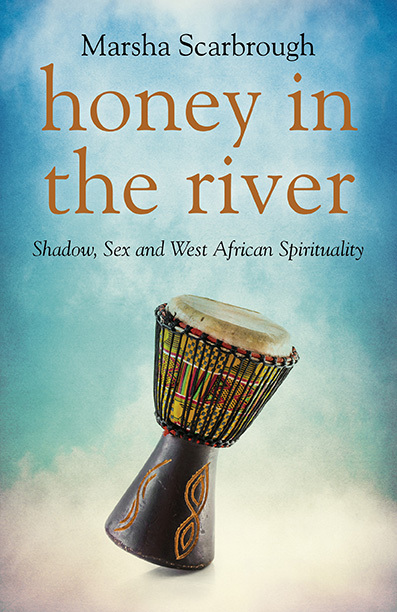 Much of the story of Honey in the River revolves around the difficulties of trying to practice polygamy. It was a worthy experiment. I think we need to look for alternatives to both monogamy and polygamy. I don’t have answers, but I did learn that honesty is essential in all relationships.